CNN’s “The Post-Racial Revolution Will Be Televised” was low-hanging fruit–but I had to pick it. In Media Ethics last week, my students and I discussed how we can enjoy a media text but not approve of all of its messages. The Walking Dead is one such dissonant text for me. I find it to be a compelling show, full of intriguing characters, an exciting driving question (what are the zombie apocalypse’s origins? ), and frustrating cliffhangers. I can enjoy the show, but not celebrate all of its features. In particular, I find its representations of African Americans to be stale and marginalizing. What I see in The Wa lking Dead is too many characters who are not stereotypes per se, but who fall into stereotypical media representation patterns. I will focus on two prominent patterns here: voicelessness and visual Othering. A handful of these representations is not a problem, but the pattern is. Let me start by writing something nice: I find Glenn to be a nuanced character. As a Korean-American, Glenn is subjected to racism and called “The Asian Kid,” but the show confronts his marginalization, even addressing how he was often asked to go on dangerous group missions. Glenn is a strong survivor, and an influential group member. He forges his own path and tells his own story. In contrast to Glenn, African Americans Jacqui, T-Dog, and Michonne fall into patterns of stereotypical media representations. Blink and you missed Jacqui’s role in the story. Dale’s meme below m ay refresh your memory of how easily the group said good-bye to Jacqui. T-Dog (pictured above) is around longer than Jacqui but still plays a marginal role, beginning as the object of Merle’s racist-fueled fury and ending as Carol’s savior following his zombie bite. Saving Carol’s life makes T-Dog a hero, but it also means he is unable to save himself. His portrayal is reminiscent of The Green Mile‘s John Coffey sacrificing self to save the White person. 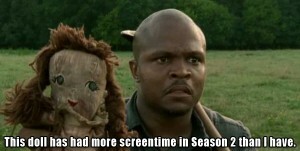 I would have liked T-Dog to have a better balance of self-sacrifice and support. Who made sacrifices for him? Michonne is almost literally voiceless in her first seasons of The Walking Dead. Viewers know little about her history (although she’s telling us now), and are not privy to many of her thoughts and ideas. 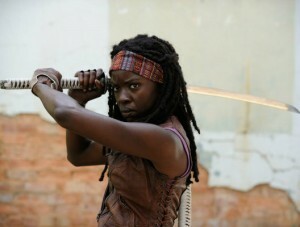 This blog post from “Fangs for the Fantasy” captures Michonne’s lack of agency, describing her as a “sword that is wielded by Rick.” More troubling, however, is Michonne’s combination of voicelessness and many markers of visual Othering. Merle captures these tw o characteristics when alternately referring to Michonne as “mute” and “Nubian queen.” With her dreads, leather vest, slaves, and sword, Michonne is marked as very different from the rest of the group. 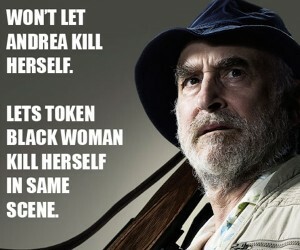 I respect Michonne’s independence and strength, but I want to know her more. Why did the writers initially make her seem like a Dothraki rather than a doting mom? It looks like Season 4 is allowing Michonne to become a well-developed character, rather than a one-dimensional, Othered image. Michonne’s portrayal (at least in the earlier seasons) reminded me of Kendra, the “other” slayer from Buffy. Can you guess Kendra’s fate? One show can’t solve the problem of media representation of marginalized groups. This post doesn’t represent a full dismissal of The Walking Dead but rather a critique of two patterns in its representation of African Americans. These representations become a problem when they repeat enough to form a pattern. And these patterns are troubling when they are not counteracted by a multiplicity of alternate representations or patterns. What The Walking Dead and other supposedly “post-racial” television shows need are greater diversity in their representations of diversity. 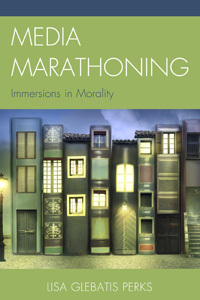 ← How Do You Judge Ambiguously Moral Characters?